Most Thai classical dance-dramas have a Prince as the hero, and a beautiful Princess as the heroine. The story usually includes many exciting adventures, misfortunes and fights against demons and rogues, but eventually the Prince emerges victorious and wins the love of one or several beautiful Princesses. 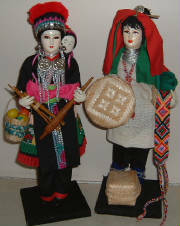 These dolls are exquisit in both colour and design. They are handmade by Mrs. Khunying Tongkorn Chandavimol of Bangkok Dolls. Their bodies are made of rayon and their faces are hand painted. 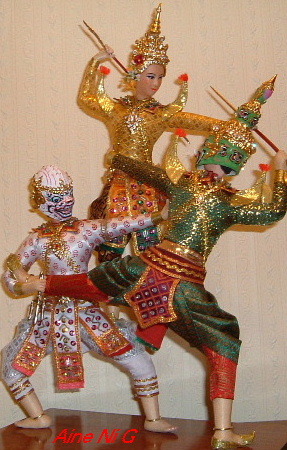 These dolls are 16" high and dressed in Thai silk trimmed with gold brocade. Khunying is a title bestowed upon Mrs. Chandavimol by His Majesty the King of Thailand for her outstanding work in the arts. 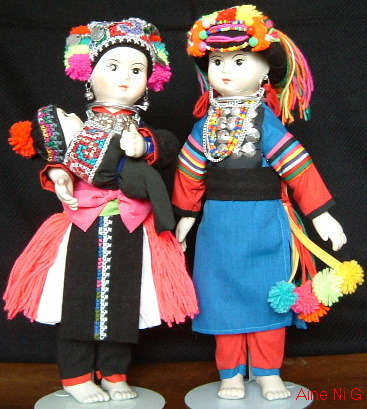 These porcelain dolls represent the women from the hilltribe of Yao.